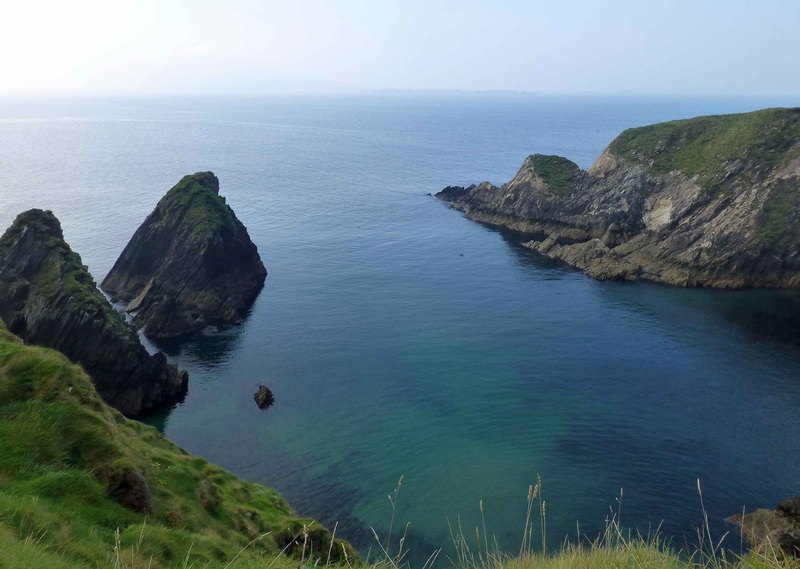 Dingle has it all - glorious food, drink and scenery. It is a terrific visit at anytime and can be visited whether the sun shines or not. 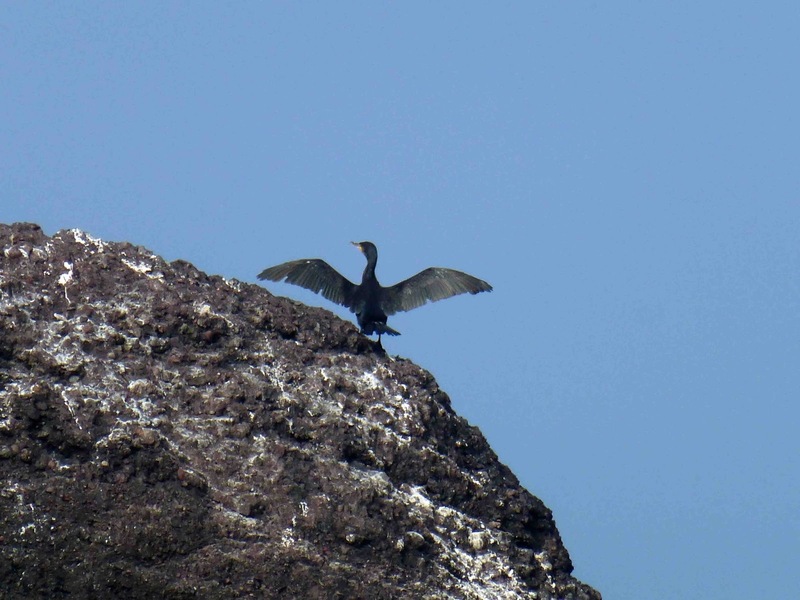 Nature doesn't have to perform at its best just because you’re on a visit. Indeed, sometimes Nature in a bad mood is as well worth seeing as it is on the days of calm and balm. 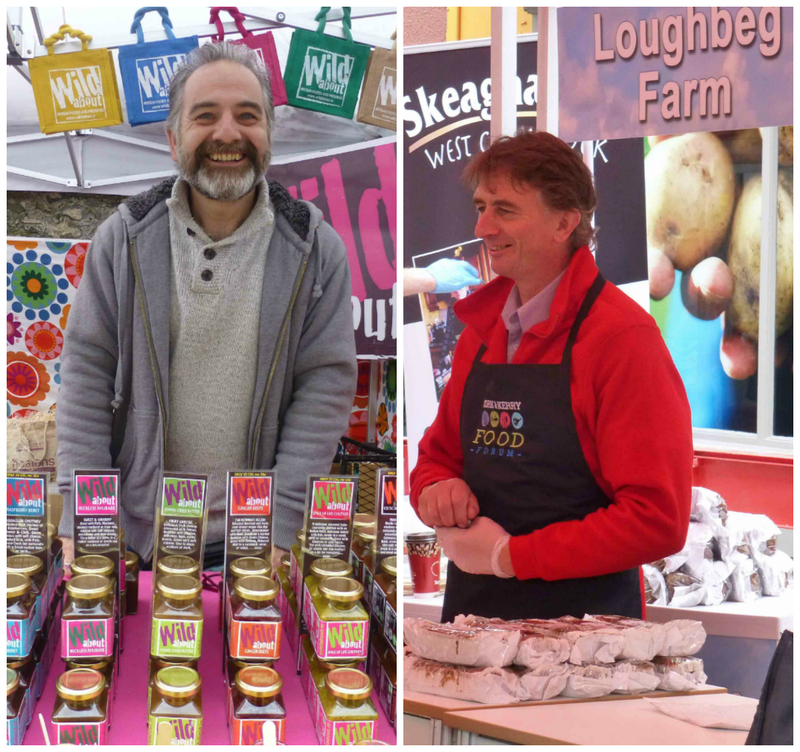 I was there for the Blas na hEireann tastings and the annual food festival and it was a marvelous few days. Tough enough start though on the Thursday with a full day of tastings for Blas in the Skelligs Hotel. Tough? Did I hear you say? Well try tasting nine blue cheeses in a row. Or, in the final session of the day, sampling 15 beers as the sun went down. 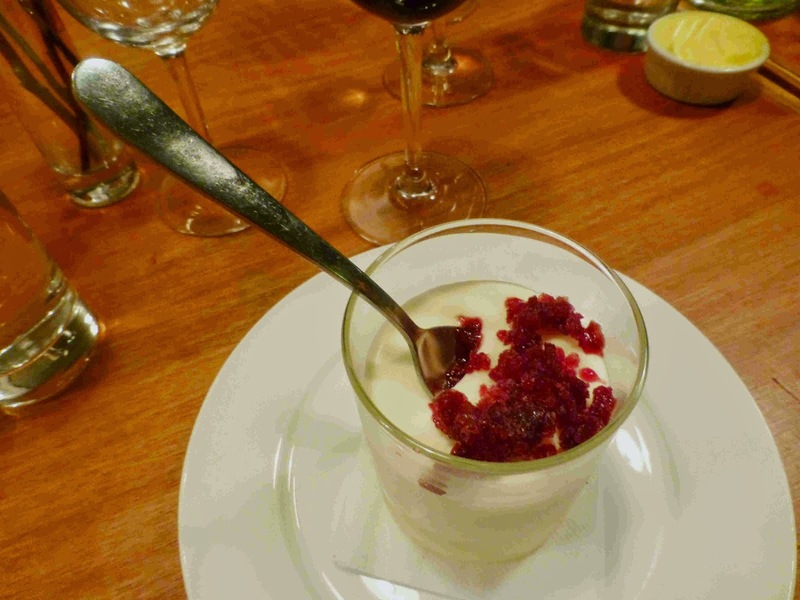 But it has its rewards and the first came later that night in An Canteen when we sat down to a very local three course meal by the brothers Niall and Brian. Superb fish on the first two courses and those amazing savoury chocolates by Dovinia were a highlight. And I must also mention that excellent Connemara Pale Ale by the Independent Brewery. 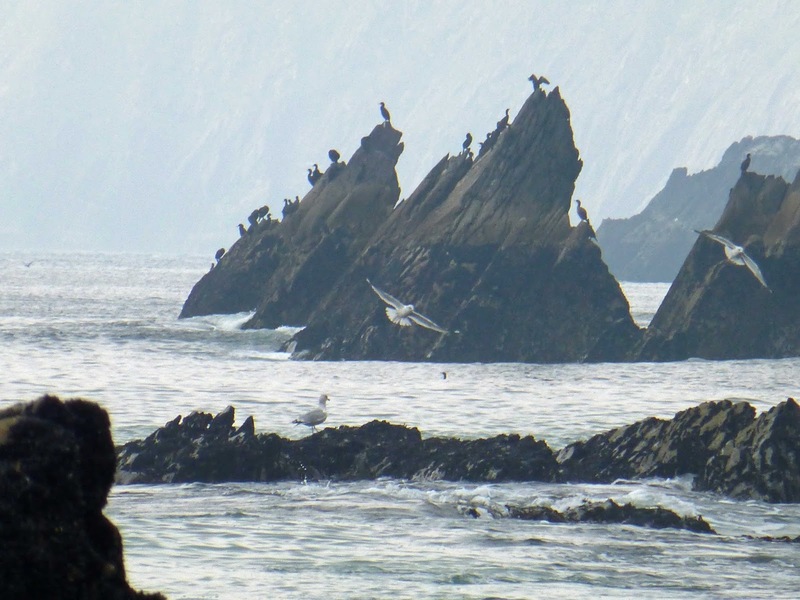 Friday was largely a free day, so we headed west with the first stop at Ventry as the sunseekers were out in some numbers and, let me say, in their t-shirts. 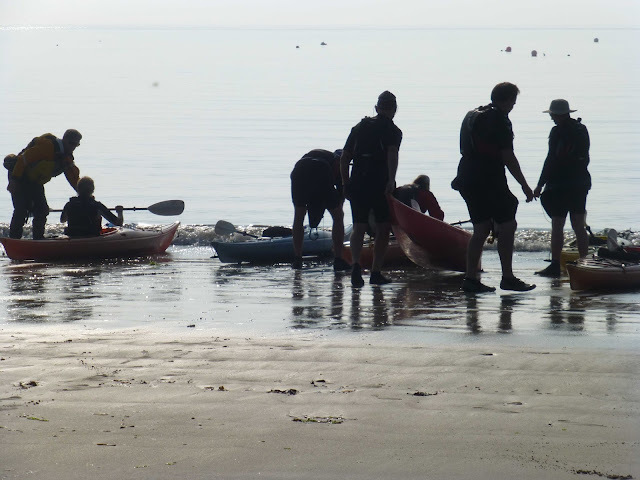 Also spent some time watching a group of kayakers getting ready and then sailing off into the haze. The weather had changed, duller and windier, by the time we got to Slea Head but we still got down to the sands and close to the rocks. The Blasket Centre is a great place to visit to get a feel for the peninsula and the islands and , as a bonus, it is a good spot to stop for lunch. Fueled up, we carried on and came to Clogher Head. Last time, our walk up here was stopped by a heavy shower but there was no such problems on this occasion. Great views out there, even if there was a little haze in the mid-distance. On then towards Ballyferriter and a visit to Wine Strand before closing the loop - the sun was out again - and cutting cross-county back to Dingle. We were keen to see the Conor Pass while the weather was still reasonable. By the time we got up though, the clouds had taken over. Still we had a fine view down to Dingle and beyond. Then an hour or two was spent at the awards by the Enterprise Office from the various counties (details here) and after that it was time to think about eating again. We were joined by some of the judges (lots of laughs with Susan and Judith Boyle) in the Global Village who came up with a terrific tasting menu, very popular too as empty plates went back every time. This was a selection of the peninsula’s finest produce over six tasting courses. 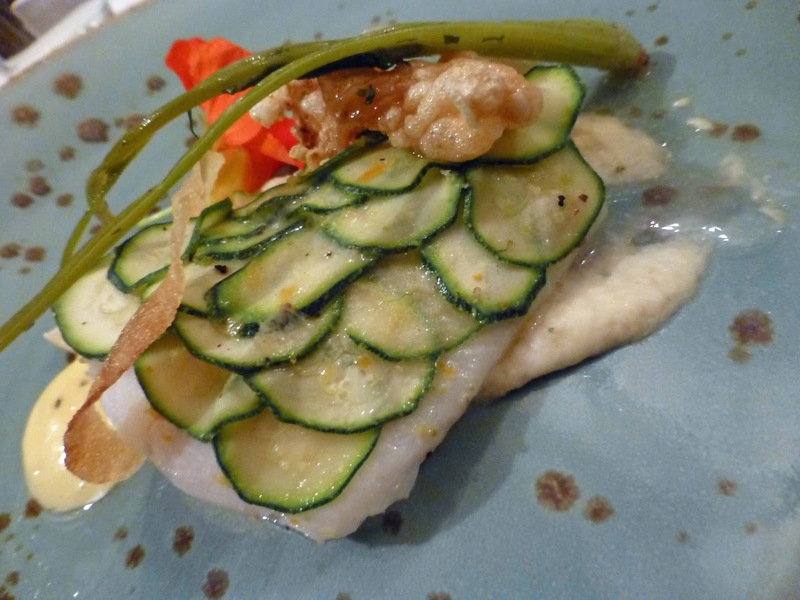 Highlights were the fish (turbot, seaweed and fennel) and the meat (wild boar, scallop and raisins). Saturday was a reasonably fine day and we were soon out and about after a good breakfast at the excellent and friendly Benners Hotel, so centrally located. Garvey’s SuperValu had their line of food already in place on the pavement outside. I had a look inside and was impressed. Outside, the market stalls on the various streets were busy and we called to quite a few. Saturday though was mainly about the amazing Taste Trail and you may read all about that here. Caught up on the news from the award ceremony for Blas and delighted for the winners, particularly for those that we know. Taste trail or not, we were still up for a meal later that night and had booked in to the Grey’s Lane Bistro. It was a good call and a lovely meal. Took it easy on the Sunday morning and, after yet another good breakfast in Benner's, two happy punters checked out and headed home. 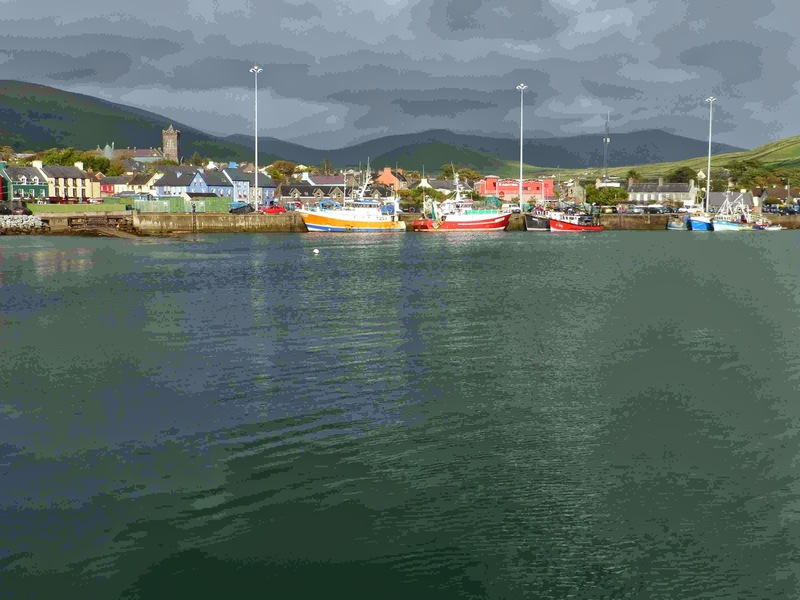 Dingle, we'll be back! Don't you know you’ll get piles? The Fantastic Dingle Taste Trail. Don't you know you’ll get piles? 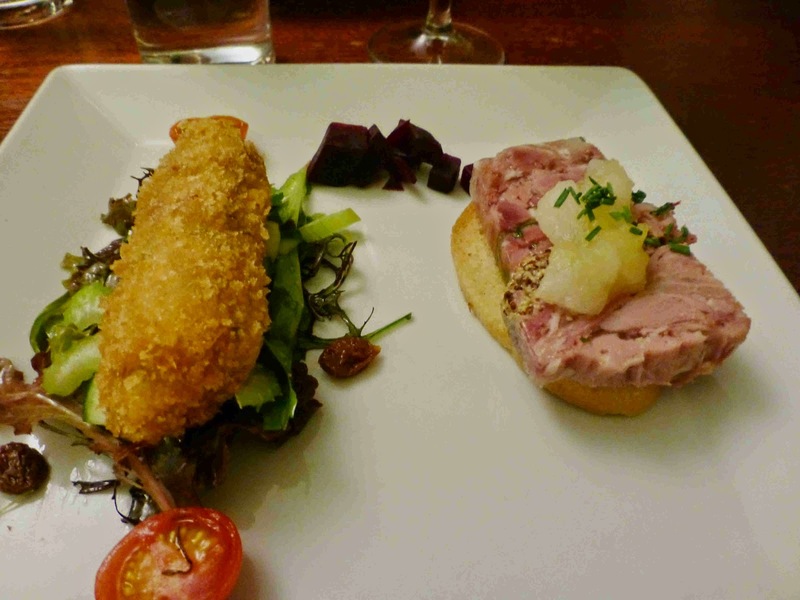 The Fantastic Dingle Taste Trail. We two were sitting (on seats) in the closed Dingle street, outside the An Canteen door, enjoying a beer with another couple. But one of the four was sitting on the street surface, as there were no more seats, when a young Irish Mammy came along and started on him. It was a laugh a minute for a while after that as the young woman sat near us and the banter continued. Only in Ireland. Maybe only on the Dingle Taste Trail. Priceless. And no ticket required! We had spent a few hours on the Taste Trail. 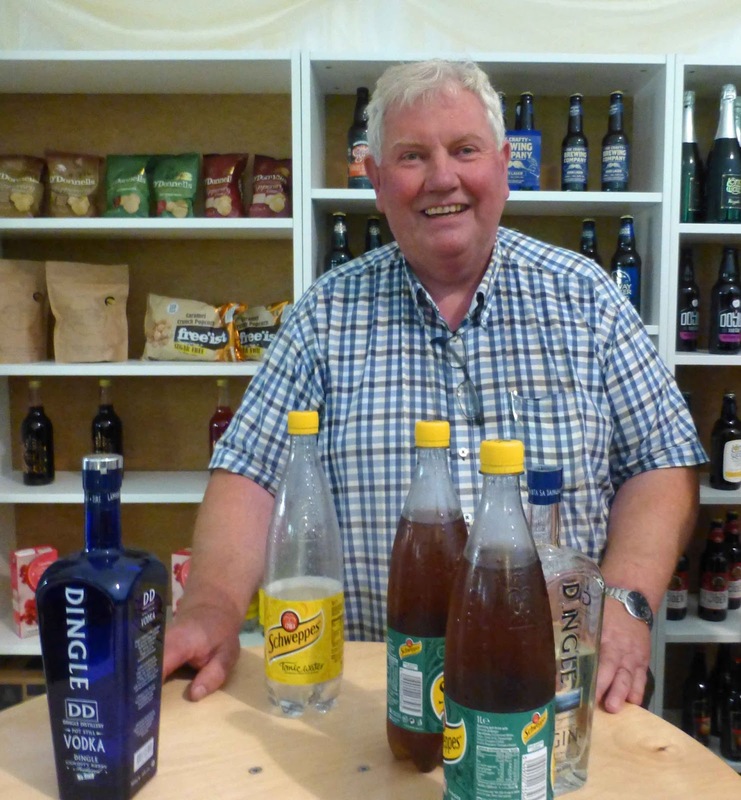 It was time for a drink and one of the best places for craft beer and cider at Dingle Food Festival, anytime really, is An Canteen. Got a great welcome, including a tasty beef sandwich, from Brian and Niall and a smashing pint of Indian Pale Ale from Andrew of Killarney Brewing Company. That Ale by the way is called Scarlet Pimpernel in memory of Killarney man Fr Hugh O'Flaherty who saved 6,500 people during WW2. A glass of the regular Golden Spear Blonde Ale also got the thumbs up. 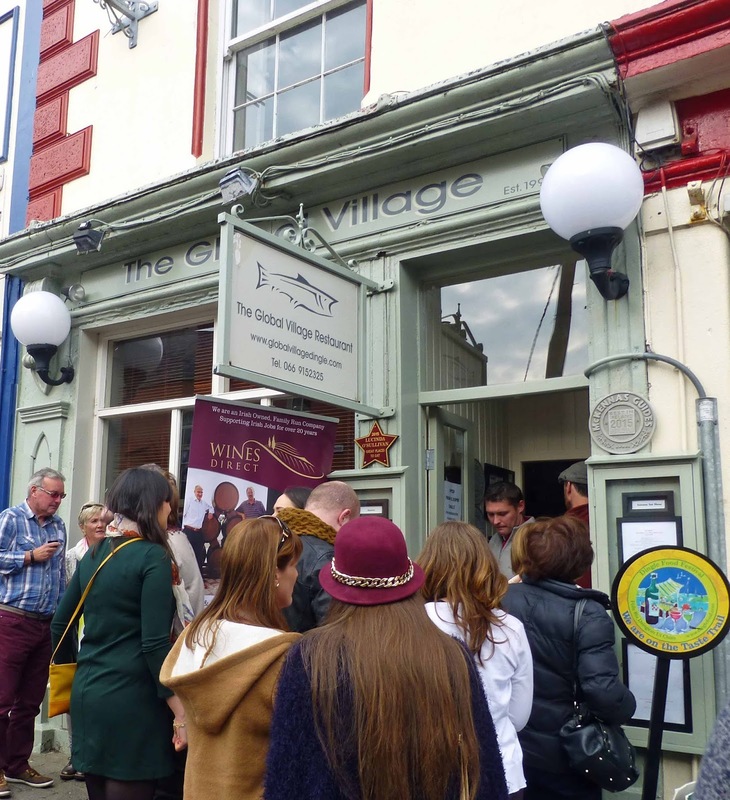 The Taste Trail at the annual Dingle Food Festival is one of the very best. The quantity of choice is amazing as close to 80 outlets take part, officially! And the quality, while it can vary, is mostly of a very high standard, sometimes really top class. And the value per bite is incredible. A book of tickets can be bought at any of the participating outlets and in the festival office and then you can go and sample wine, beer, whiskey, fish, meat, pizza, desserts and more. We enjoyed our few hours on the trail on Saturday afternoon and had some memorable stops, particularly at Fenton’s, Out of the Blue and finally at An Canteen. There was a big delay at our first port of call as the Fish Bar on the Marina seemed surprised by the massive crowd that turned up for their Tandoori Prawns on a skewer. But there was no problems with queues elsewhere. Yes, there were queues for sure but all moved quickly along. There was one other disappointment though in that the Liam O’Neill/Derry Clarke charity event at O'Neill's art studio was unavoidably confined to Sunday. Fenton’s had a massive line, out on to Green Street, through the full length of the restaurant, right into to the back garden. But it moved along nicely and soon we were sitting down eating a couple of delightful organic Dexter Beef sliders and then sipping a Sloe Gin Royale Pink Fizz. 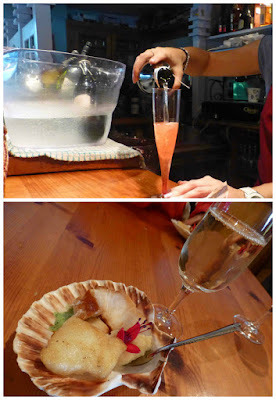 The drink was a mix of gin, made from locally foraged sloes, and prosecco. 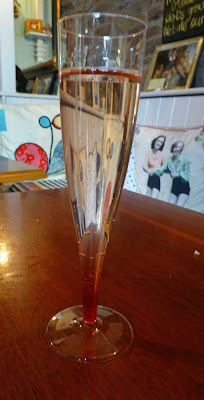 A wee amount of the red gin was poured in first, and then the prosecco was added to change the colour to pink. But the big kick remained in the bottom of the flute and that last mouthful was an ambush of liquid delight! By the way, all this (beef plus fizz) cost us six tickets (12 euro worth). More top class stuff to eat and drink at Out of the Blue. They had a few choices but we went for the two ticket option: Roasted halibut fillet with steamed smoked cod, rocket and toasted hazelnut pesto, roasted red pepper and garlic pesto, and celeriac mash. And that was washed down with a small glass of Verdejo (just one ticket). The Boatyard next door had their tables out in the sun and here we stuck with the fish theme, a lightly spiced Fish Curry. Up along Green Street after that and down Main Street heading for Orchard Lane to see the Trade It exhibition that featured producers from all over Europe, from Poland, Finland, Spain, UK and Ireland and more. It was scheduled for 2.30 to 4.30, but my jaw dropped when we arrived at 3.30 and found an empty tent. It had all finished up. I had really been looking forward to that. Still there were plenty of market stalls in the Lane and we had a few samples of various foods, including a marvellous Goats Cheese from Helen of Knockdrinna. And then we had a little bonus when Chef Marc Murphy of the Dingle Cookery School gave a demo (how to cook hake) at their stand. Next, we headed for An Canteen and that hilarious meeting with the Irish Mammy! Time to hit the Taste Trail. 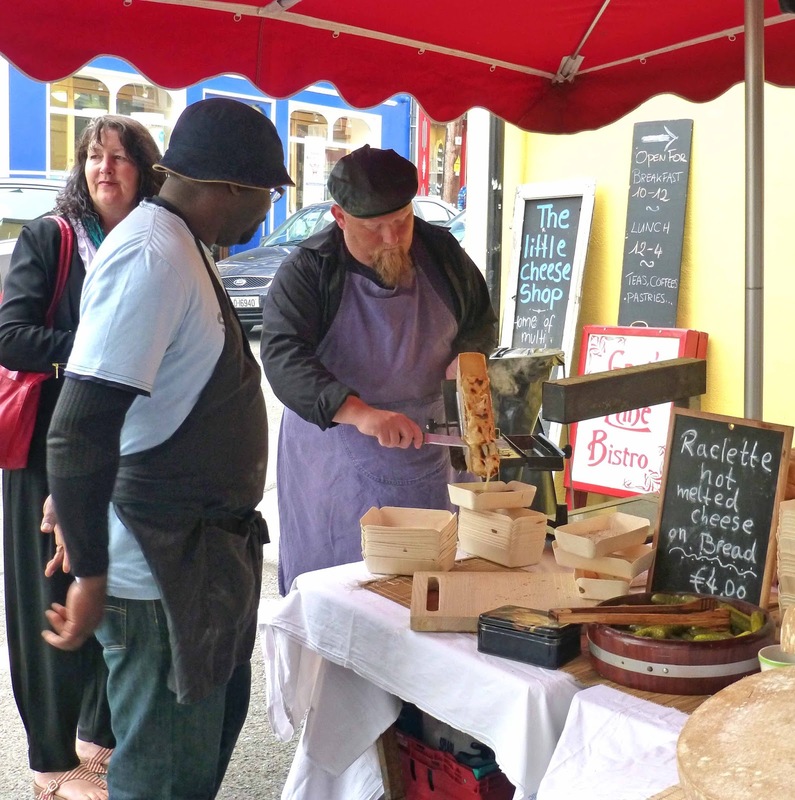 No danger of going hungry on the streets of Dingle last weekend. 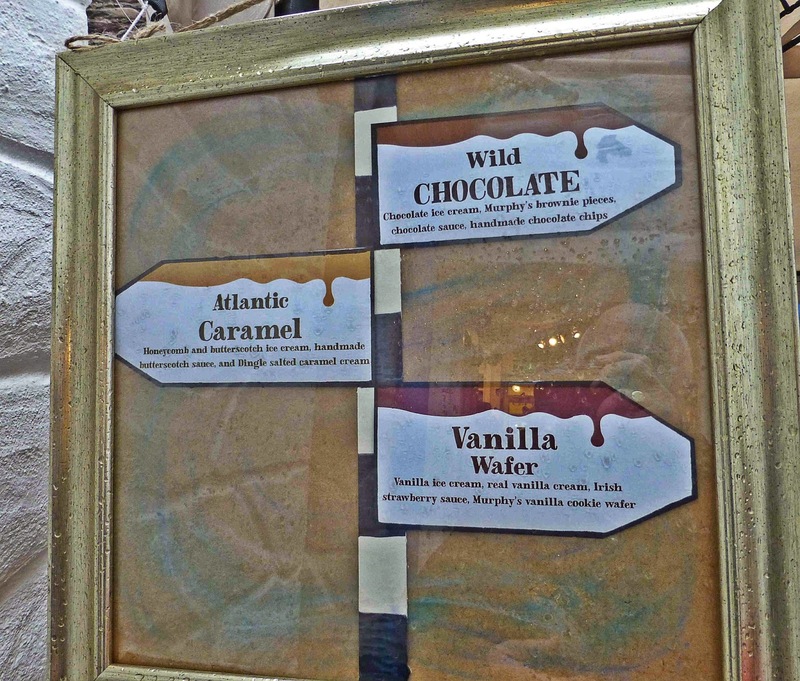 No less than 81 outlets took part in the gigantic Taste Trail, a major feature of the annual Food Festival. And it wasn't just food outlets. An Siopa Ceol, Liam O’Neill Art Studio (where Derry Clarke served up the local Mutton pie) and Dingle Crystal were among those in the merry mix. And what a mix! Your tokens (or cash) could buy you anything from a Shark Snack to a Pumpkin Soup, from Vegetarian Sushi to those mutton Pies, from a Dublin Coddle to Dingle Fudge. 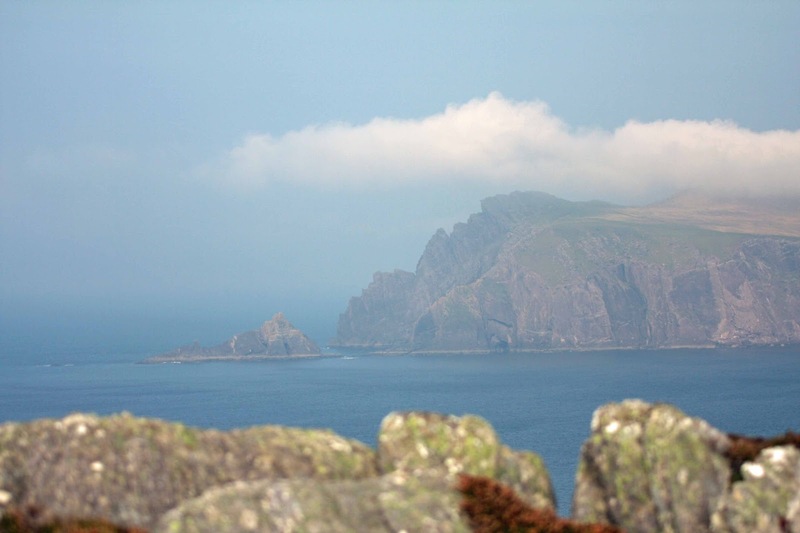 Not to mention a full range of drinks, including local spirits (Dingle Distillery) and local beer (Tom Crean Brewery). So where to start? 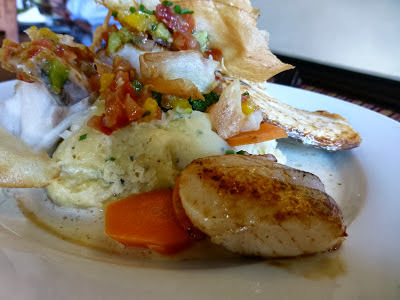 The highly rated Out of the Blue was our first port of call and here we enjoyed their shark bites. Tasty stuff. 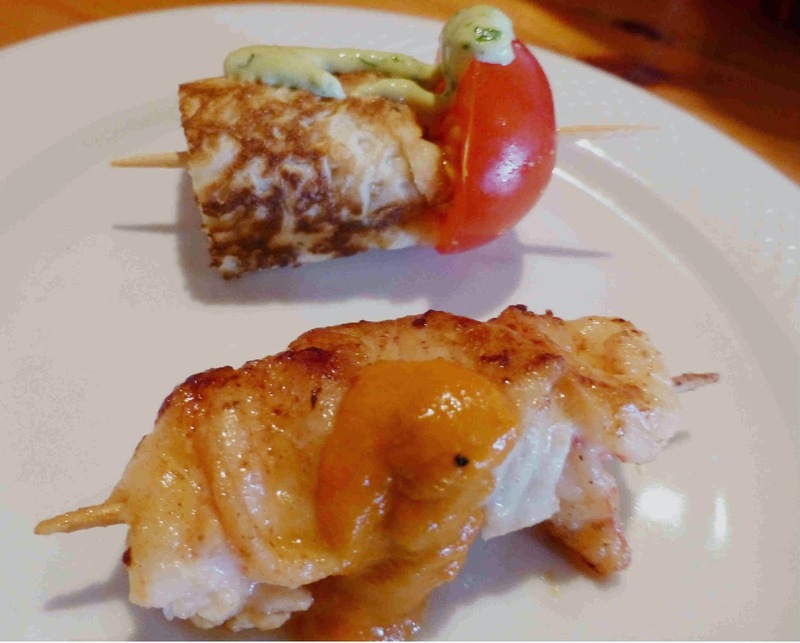 From a nearby wagon, we got some fish on a skewer. Time then for a glass (or more) of wine at An Siopa Ceol where Karwig Wines rep Frank conducted a band of enthusiasts through a quartet of whites. 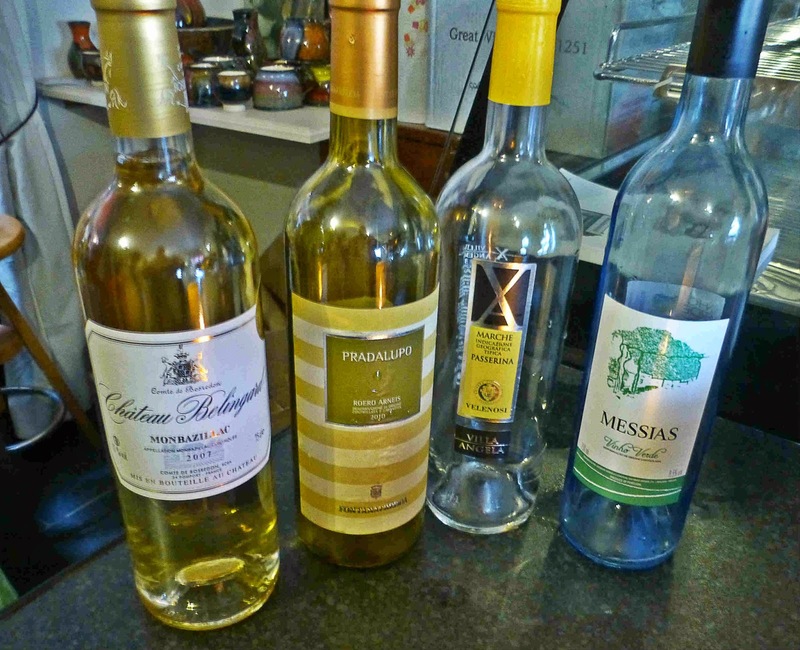 The opening wine, a “spritzy” Vinho Verde, provided a cheerful allegro. He brought us down to andante then with a duo of Italians, Passarina and Pradalupo. And the finish, a golden 2007 Monbazillac by Chateau Belingard, was dolcissimo. Bravo Frank. That pleasant interlude behind us, we hit the trail again. 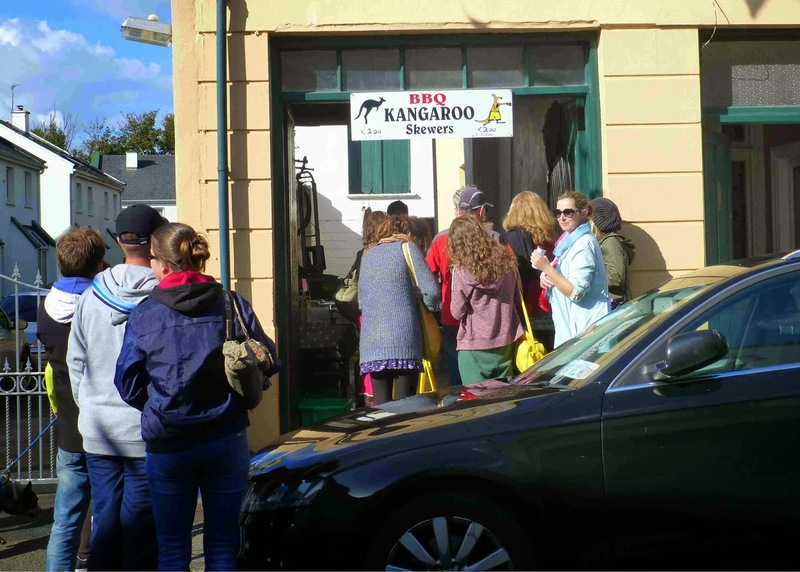 Big queues at Fenton’s for their Dexter mini-burgers and at Finn McCools/Bushtucker Meats for the kangaroo. The vegetarian Raclette at the Little Cheese Shop was causing a lot of oohs and aahs as we passed. Time now for a pause and a sit-down at the Pie Cafe. 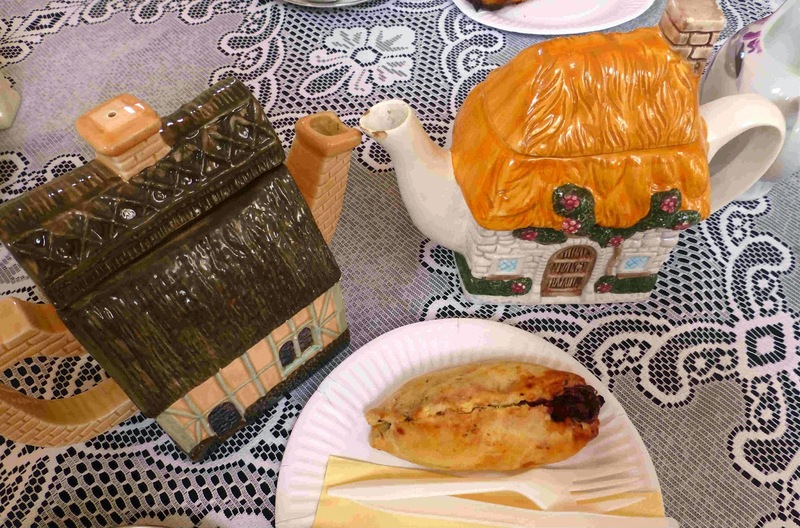 Here I enjoyed a Sweet and Savoury Pie and a pot of tea. The Cornish Pasty had one half filled with venison in red wine and chocolate, the other with raspberry and strawberry. Super. Must remember to add this place to my list of Irish Tea Rooms. We thought we had all the market stalls covered during our morning ramble but, just off Main Street, we stumbled on another packed section in a cul de sac where we said a quick bon jour to Laurent of Buffalolo. The highlight here was a superb Venison Sausage with a blackcurrant mustard by local butcher Jerry Kennedy. 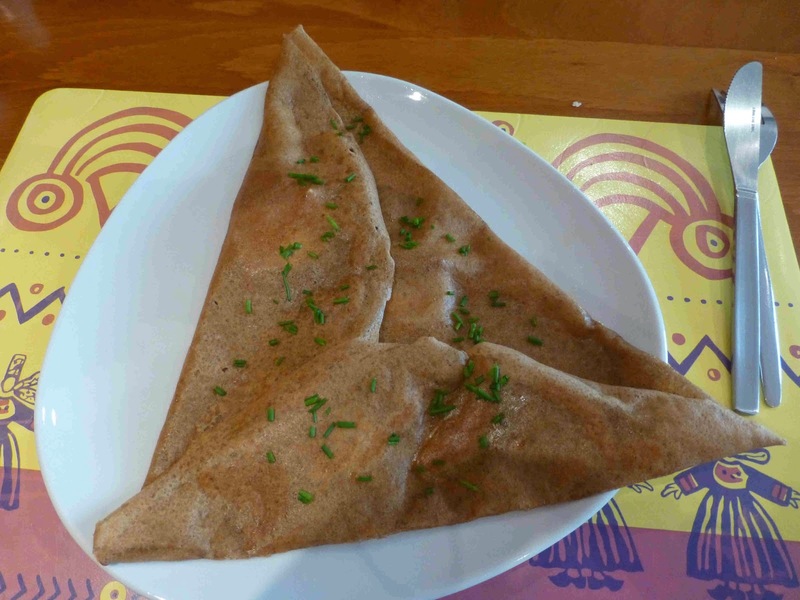 Retraced our steps to Main Street and headed down to John Street where we had another top class treat, a buckwheat crepe filled with goats cheese and sun-dried tomatoes at the Creperie Ti Koz. Didn't have the Breton cider there but, back on the sunny street, the need for a drink asserted itself. An Canteen was (and always had been) our destination of choice. The street outside was packed and it looked impossible to get in. But there was no bother. It was just that the punters had moved out to get the sun. At the temporary bars set up around the small restaurant space, craft producers such as Franciscan Well, Porterhouse, Mountain Man, and Tempted? were selling their tasty wares. Met Daniel Emerson (Stonewell) and Sam Black (Kinsale) and they gave me a sample of a cider and beer mix that they have been collaborating on. When I asked what they were calling the tasty drop, full of flavour and strong at 15% or so, they chimed W.I.P. (work in progress!). Worth keeping an eye on. A shower brought the crowd back into An Canteen. The rain didn't last too long and soon we were looking for something sweet to finish the tour on. Murphy’s Ice Cream was to be our final stop and here I enjoyed their Atlantic Caramel (honeycomb and butterscotch ice cream). A sweet finalé indeed. 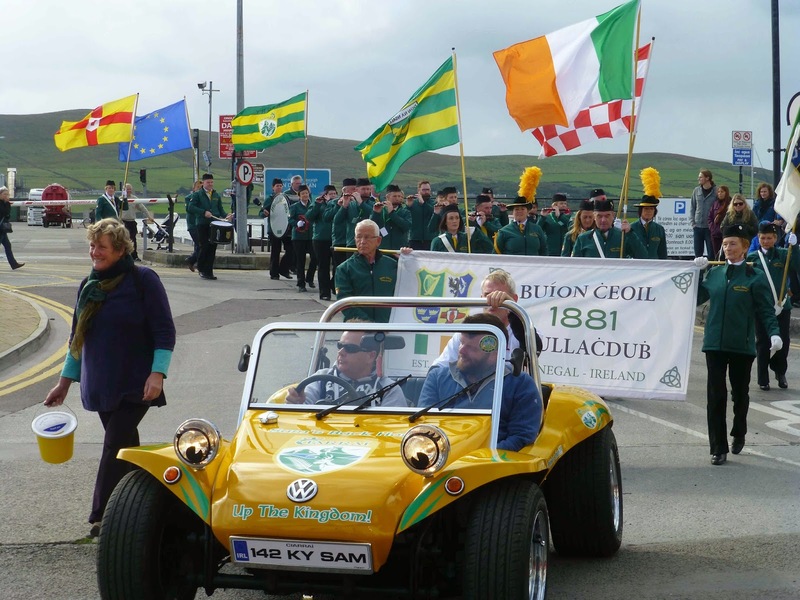 Trucks, tractors, trains, even tourists, may have delayed our arrival in Dingle last Thursday but nothing was keeping us away from the Blas na hEireann Awards or the fantastic Dingle Food Festival. Artie Clifford and his hard-working Blas committee had all the products - there are well over two thousand in some ninety categories - lined up for the tables of judges in the Skellig Hotel. 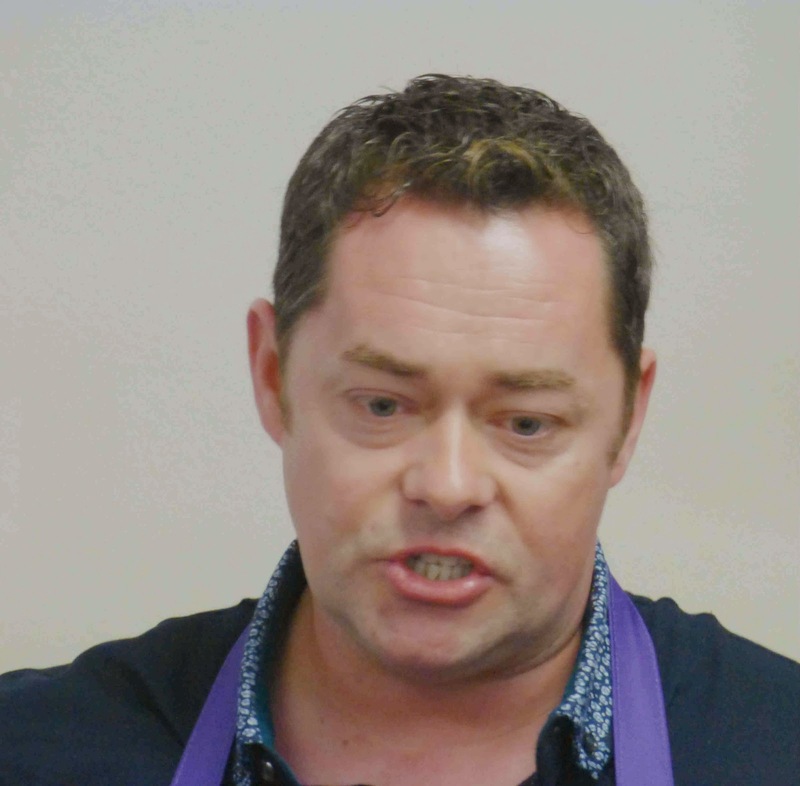 The food and drink products would be fully tested and so to would the palates of the judges as there were two sessions lasting a combined total of around five hours. You have no idea of who makes what. It is not a blind tasting as such (no blindfolds!) but the unpackaged products in front of you are “anonymous” for want of a better word. There are up to five on the shortlist for each category and each judge tastes quite a few groups over the morning and afternoon. My standout category? 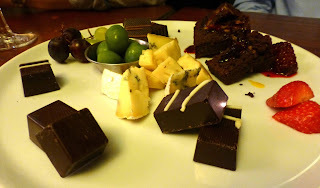 I thought the standard in blue cheese (winners: Cashel Blue) was top class, with three of the five outstanding. See the full list of winners here. 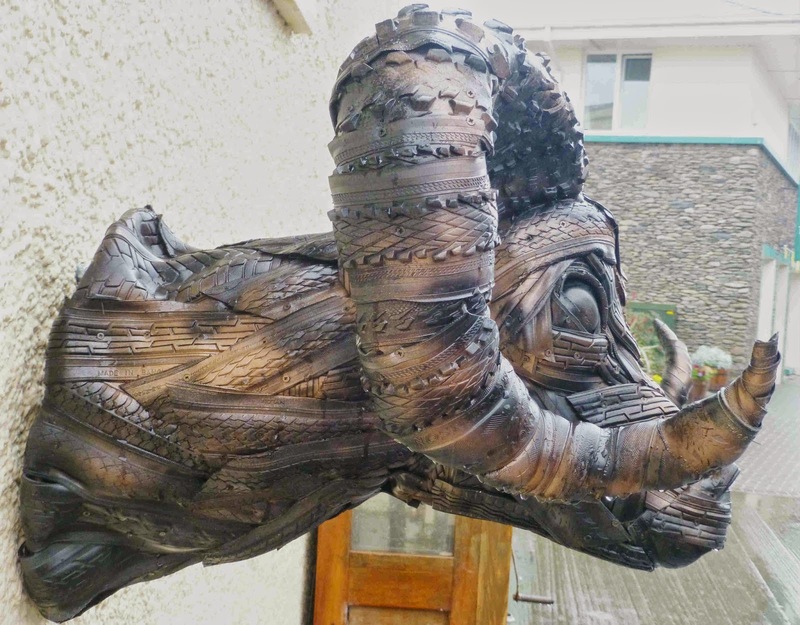 created by Mick Davis, is called Ram's Head. With the judging completed - we still wouldn't know the winners until Saturday afternoon - it was time to check in at our accommodation. The next event was the press opening of the Dingle Food Festival at the Tom Crean Brewery. 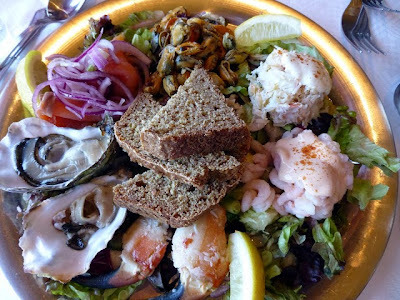 More food here but, after all the little bites during the day, I opted for a couple pints of the cool and fresh Tom Crean lager. Lovely chats then with fellow judges and bloggers and all fell silent as Neven Maguire, presented earlier with a special award by Blas, cut the ribbon and opened the festival. Next port of call was the bar in Benners. 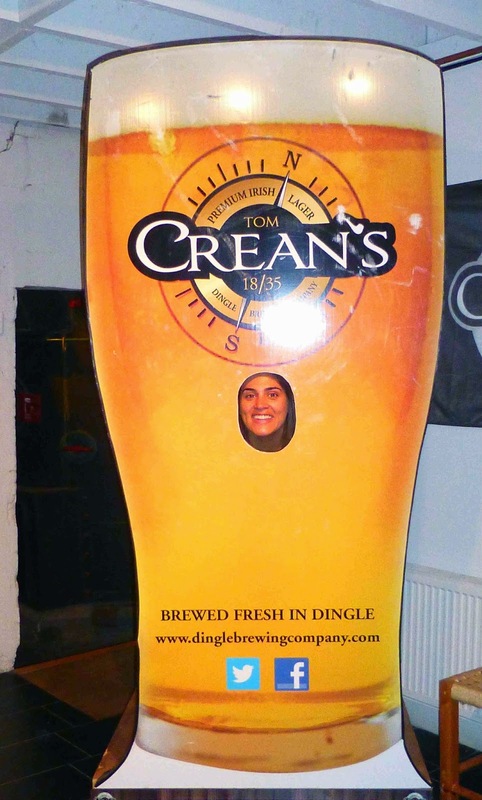 Tom Crean available there too of course and a whole selection of Irish craft beers included on the drinks menu. Very impressed with that development (Benner’s also have Dingle vodka and gin from the local distillery). Next stop was An Canteen, another huge supporter of craft beers. Here hosts Brian and Niall greeted us and served up a fantastic meal, made with pride and passion and no little skill, from local produce. Even Neven was highly impressed. Time then, for me at least, to stroll down the lane and head back to the bed. Friday would be another busy and very enjoyable day. East Cork's Sandra and Joe Burns. The rain came down for a while on Friday morning but that didn't stop the punters from turning up in the farmers market to see Neven Maguire signing his new book Fast. He was in great form, chatting and smiling and standing in for photos as the fans queued up to buy the book. Thanks to Lisa McGee (@Dingle Spirit on Twitter), we had heard that there was a two o’clock tour at the Dingle Distillery so we strolled out to the west of the town and joined an international group for a very interesting 75 minutes or so. See separate post here on this tour. On the way back, we called into the Dingle Cookery School opening. Here again, Neven was doing the honours and, as usual, joining in the fun. It is a tremendous facility. Lots of courses are now available, some short, some long. Check out all the details here. Hope to do a separate story on this also. And still more to do. Next Blas event was the announcement of the winners in the awards given by the local enterprise offices. Cork, Donegal, Galway, Kerry, Limerick, Louth, Mayo, Meath, Tipperary and Waterford were among those represented at Benner’s. 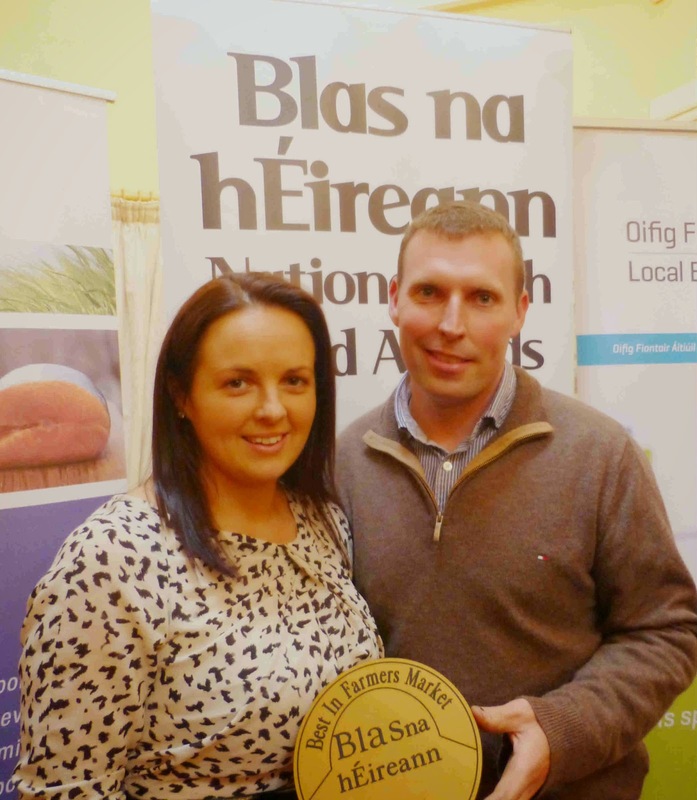 Delighted to see Beara Seafoods and Joe’s Farm, two small family producers that I've met this year, among the winners. Friday night found a group of us in Idás, an excellent restaurant more on John Street. Lots of conversation and good food, good wine too, as an enjoyable evening unfolded. Great to meet chef and owner Kevin Murphy who had laid on a special tasting menu for us. Check Idás out if you’re in the town or the area - worth a detour! The rain, aside from a few showers, held off on Saturday and just as well. First stop was the Blas Producers Networking Event. Buyers were here in their dozens and it was great chance for the producers to show and talk about their produce. Lovely to meet up again with Olivia from An Olivia Chocolates, a winner last year (and gold again this year), with Sam from Cloudberry Bakery (also a gold this year - see her tasty produce in Brown Thomas in Cork) and with so many more. On the Taste Trail at Out of the Blue. Their shark bite (front) was a big hit! And then it was off to the market which covers most of the central streets of the town. This includes the regular farmers market but it is so much more. Producers who have won in the previous year’s awards had the opportunity to have a stand and so the selection of foods and drinks is huge. The Foods of Athenry, Hartnett’s Oils, Wild Irish Foragers and Blurini Blasta were among the many stops we made. Soon though we were down to business, on the Taste Trail. With over 80 participants, this must be the biggest and best of its kind in the country (if not, let me know!). 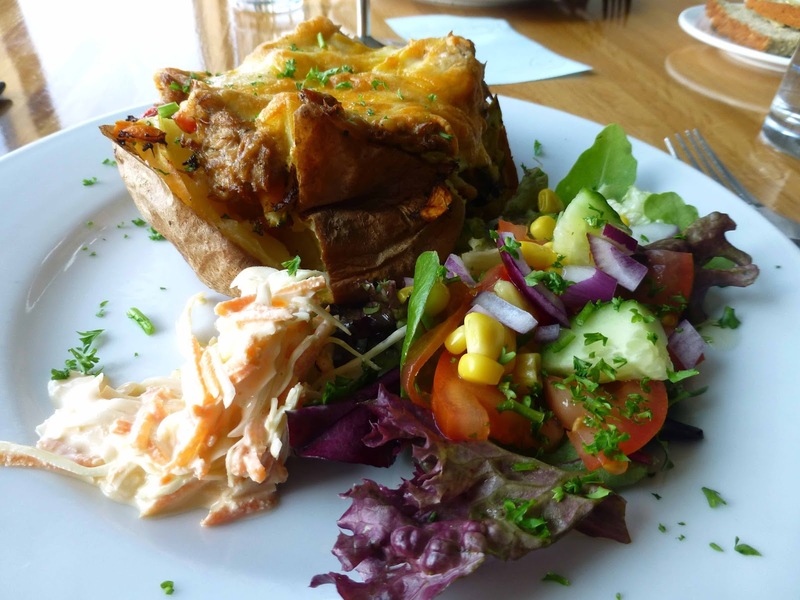 Everything, from shark to kangaroo, from ling pie to Dingle Fudge, from wine to craft beers and ciders, available. Purchase with your book of tokens or with cash. Separate post here. All the while the awards were being presented in the cinema and again it was a delight to see many hard working producers that I know get their just rewards. Just as well our booking for Saturday's dinner was on the late side. It was 9.15 when we arrived at Out of the Blue, the fish specialist restaurant on the waterfront in Dingle. 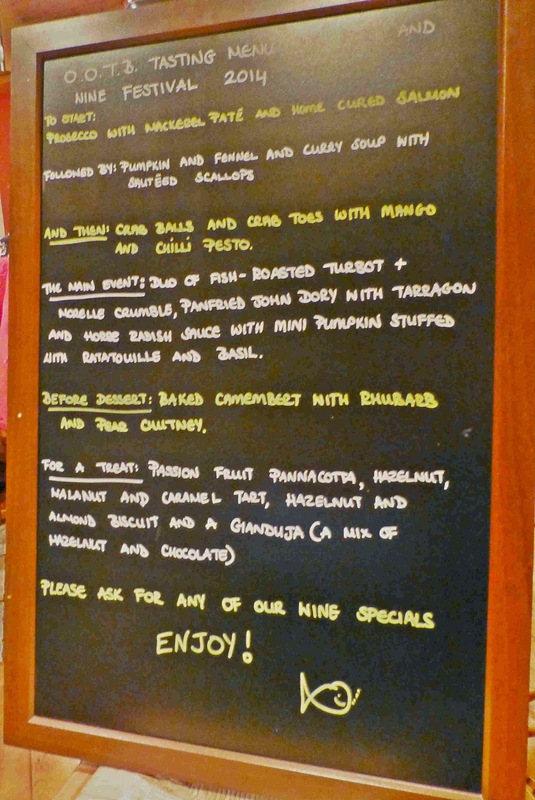 The French chefs had a special multi-course menu for the night, even a special wine menu. It was a terrific meal in a small place with a great atmosphere and a great staff. Highly recommended. Post to follow. Stamina had run out by the time Sunday morning dawned. There was still much to do, including the Taste Trail and market again, but home called and we headed east with lots of lovely memories and a promise to ourselves to call again.